So, today’s question is in two parts. 1. Do YOU like books with complicated plots and unexpected endings? 2. What book with a surprise ending is your favorite? Or your least favorite? My answer to the first part, “do I like complicated plots and unexpected endings?” is a resounding YES! I think it’s one of the things I liked best about Dune. All the intrigues and plots and subplots made it like taking a long trip down a winding road and checking out all the historical markers, garage sales, and tourist traps along the way. I hate reading a book where I know what’s going to happen, it really takes a lot of the fun out of it. Maybe that’s one of the things I didn’t like about The Blue Notebook, none of it was a surprise… except just how far human depravity can go. As for what book with a surprise ending is my favorite, I’d say The Book Thief is my favorite book. I don’t know whether it was a “surprise” because we know Liesel is going to die by page 3, and yet… somehow… her death is still a shock, like when a person with cancer dies in a car crash. You knew their end was coming, but when it happens it’s a shock. It wasn’t the fact she died, but the how and what all happened in the book before that. I actually cried for several minutes, and couldn’t start a new book for a few days because of how much emotions it had wrought in me. That’s why The Book Thief is my all-time favorite book. I’ve never had a book reach me so deeply. As for my least favorite “surprise ending” book, that’d be BoneMan’s Daughters. By the time the end came, I was hating the book so bad, there was nothing Dekker could do to bring me back. I’d lost my willing suspension of disbelief, so the ending was ridiculous to me. So how about you? Do you like complicated and twisty books? What’s your favorite surprise ending? Check out other Twisty Booking Through Thursday answers! Uncle Chestnut is a great storyteller, and he enjoys telling them as much as Jack enjoys listening to them. He makes faces, uses voices and acts out parts of the tale he’s telling. When I read this, my mind immediately went to my sixth grade teacher, Mr. Crawford (whose first name, coincidentally, was also Jack). Mr. Crawford didn’t teach history to us, he performed it. His face reflected the Pharaoh as he covered ancient Egypt. I still remember when he was telling us about Israel’s crossing the Red Sea, and he was pretending to be one of the Egyptian cavalry soldiers pursuing them: “Whoa, Nelly… you can’t drink that water!” was his command to his horse as “Nelly” was getting ready do sample the wall of water. Mr. Crawford, like Uncle Chestnut, made the stories come alive. 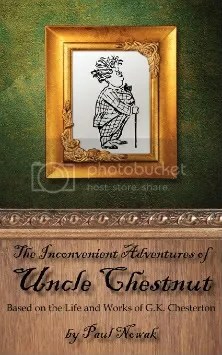 The Inconvenient Adventures of Uncle Chestnut isn’t a story, specifically, but rather more anecdotal. In the book Jack, the narrator, is remembering life with his eccentric writer-uncle. It’s full of wisdom and good sense that’s definitely lacking today. The author, Paul Nowak, was inspired by G.K. Chesterton, an early 20th century writer who inspired C.S. Lewis, J.R.R. Tolkein, Mahatma Gandhi, just to name a few. More recently, Neil Gaiman and Terry Pratchett have referenced, credited and even created characters based on Chesterton. As I first started reading this, I thought it was written by the actual nephew, but I quickly realized that wasn’t possible. Then I thought maybe Nowak was updating Jack’s diary, or that Jack would turn out to be C.S. Lewis. It wasn’t until the American Idol reference that I finally understood that this book was really a work of fiction. Yes, Nowak based Uncle Chestnut on Chesterton and used Chesterton’s work to be as true to him as possible, but it is fiction. It’s such a surprising little book, not at all what I was expecting. As it is the first in what the author intends to be a series, I really hope the next book isn’t far off, because I can’t wait for my new favorite uncle to visit some more. Some little things about the book, though… The only fault I could really find with it other than the few typos about which Nowak warned in the accompanying letter is this: It is too short. I had hardly settled in before it was over. I’m not saying it to be funny, I really mean that the length of the book actually left a negative feeling. You know, like when you go to the ice cream shop and order a large, thinking you are really going to get a treat, and they hand you a kiddie cone? Ultimately, somewhere down the line, it might be a good idea to consolidate books into a 200-300 or so page book. The other off thing I had to say about it is that it’s supposed to be kinda-sorta a kids book, but I’m not really sure it fits that. Maybe, IDK… it’s a bit Winnie-the-Pooh like in style, which was actually a very surprising thing to have captivated my kids attention. I haven’t read this book with them yet, so maybe they would really like it, but it just seems like something the kid inside the grown-up would like. By the way, make sure to check out the book’s site at http://unclechestnut.com/ . There you can learn more about the man who inspired this book, G.K. Chesterton, as well as search quotes and sign up for the Uncle Chestnut’s quote a day newsletter.